Chad Johnson In Jerk & Jon Colorful Pants & Louboutin Dress Shoes! 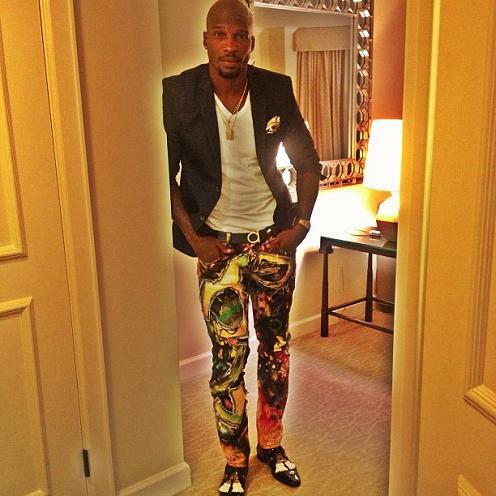 Chad Johnson posted a photo of himself earlier today wearing this, well, colorful outfit. Many wanted to know where they could find this out. The fitted colorful trousers are a pair of Jerk and Jon Men’s Pants ranging between $220-$312. His shoes are a pair of Louboutin men’s dress shoes. The athlete is known to be an avid Christian Louboutin shoe fanatic. He’s even admitted so himself. Are we feeling this outfit. Pingback: Outfit of the Day – Dance All Night to the Best Song Ever | Through Ian's Eyes.